Early in the morning on 28 December 1908, just a few days after Christmas, a severe earthquake struck the Messina Straits, a rather narrow sound that separates Calabria, in southern Italy, from Sicily (Figure 1). The shaking was distinctly felt in Albania, Montenegro, and the Greek Ionian islands, about 400 km to the east and northeast of the Straits; in Malta, about 250 km to the south; and as far as Ustica Island, about 220 km to the west. The earthquake was catastrophic in the epicentral area and was immediately followed by fires and a large tsunami. Messina (Sicily) and Reggio Calabria (Calabria), two significant cities located less than 10 km apart on the two facing shores of the straits, were almost completely destroyed, and buildings were severely damaged over an area in excess of 6,000 km2. Of the population at the time, estimated to number 140,000 at Messina and 45,000 at Reggio Calabria, a significant fraction was reported dead. Assessing the total number of victims has been problematic, as fatality estimates range from 60,000 to more than 100,000, yet 1908 was undeniably the deadliest European earthquake ever and one of the deadliest worldwide. Guidoboni et al. (2007) contend that 80,000 people were killed by the earthquake, including as many as 2,000 who died as a result of the tsunami. Waves up to 12 m struck the shorelines south of Messina and south of Reggio Calabria, displacing the rubble from collapsed buildings and completing the destruction. All communications in the affected area were disrupted, and rescue operations had to rely on access from the sea. Units of the Russian and English navies, already in the area, were the first to offer immediate relief. In particular, medical officers of the Baltic Guard-Marine brought the first medical aid to the earthquake victims, and Russian researchers were the first to offer psychiatric assistance. Damage in Messina and Reggio Calabria was exacerbated by the poor quality of construction and building materials, as well as by the occurrence of significant earthquakes during the preceding 15 years. Especially in southern Calabria, the population and their dwellings had been shattered in 1894, 1905, and 1907 during earthquakes that were all larger than Me > 6 (Me is an equivalent magnitude obtained from intensity data) (Boschi et al. 1995; Figure 1). The Messina Straits are in the middle of the Calabrian arc, one of the most seismically active areas of the Italian region and of the entire Mediterranean basin. The straits area itself had been struck several times in the past, though not with the same violence as in 1908. The historical record (Guidoboni et al. 2007) reports at least two earthquakes with Me > 6.0, respectively on 31 August 853 (I0 IX–X) and 6 February 1783 (I0 VIII–IX). The last event took place at the northern end of the straits and was part of a two-month sequence of five major earthquakes that struck a 100-km-long stretch of southern and central Calabria. All these earthquakes produced extensive damage both in southern Calabria and northeastern Sicily, particularly in Messina. The historical records also report more elusive but presumably significant earthquakes in 91 B.C. (I0 IX–X) and A.D. 361 (I0 X). After a few decades of great progress in the development of seismological instruments (Dewey and Byerly 1969), the beginning of the twentieth century witnessed a dramatic increase in the number of seismic instruments installed worldwide, some of which had the latest designs and were rather reliable in their performance. For instance, many Wiechert seismographs were in use around the world in the early 1900s, providing goodquality recordings that can still be analyzed with modern techniques. Some of these instruments are still operational, e.g., Göttingen, Sweden (Ritter 2002). Due to the simple optical principles underlying the measuring techniques, ground-surface leveling instruments available at the time were nearly as reliable as recent ones. Despite the fast progress in the number and technological characteristics of the available instruments, however, the cause and mechanism of earthquakes were largely unknown. The existence of a close link between faulting and earthquakes had started to be accepted in the second half of the nineteenth century following observations that earthquake patterns can be related to geographical and geological features (Hoernes 1878) and observations of coseismic surface breaks matching the topography (Gilbert 1884). These pioneering ideas gained momentum following the major San Francisco earthquake of 18 April 1906. The first report on this earthquake, prepared by a commission chaired by Lawson (1908), put together a large set of observations, including surveys on the damage distribution and surface ruptures, seismic recordings from stations worldwide, and geological analyses of the crustal structure of the epicentral region. Taking advantage of these observations, Reid (1910) developed the theory of elastic rebound, which was published in the second volume of the San Francisco earthquake commission report. This effort provided the first unifying picture of the physical process associated with rupture in the Earth’s crust. ▲ Figure 1. (A) Location map of the Messina Straits, showing selected historical earthquakes and the epicentral locations calculated by Omori (1909) (a) and Baratta (1910) (a and b). (B) Intensity pattern for the XI and X degrees of the 1908 earthquake (from Baratta 1910), also showing the location of two inferred epicentral areas (dashed patches), the main located just west of Reggio Calabria, a secondary one located northeast of Messina near the northern end of the Straits. These areas, also shown in Figure 1A as a and b, were derived from directions of fallen monuments (shown by small arrows) using a method developed by Irish seismologist Robert Mallet in 1858–1860. Notice the different decay of intensity on either side of the straits and the strong asymmetry of damage toward Calabria. In such a rapidly changing scientific framework of earthquake theory, many scientists from all over the world went to the Messina Straits area immediately after the 1908 earthquake and investigated the effects of the ground shaking on buildings and on the natural environment. The origin of the 1908 earthquake itself was largely debated by contemporary scholars: a violent volcanic explosion in the straits was a popular hypothesis, implying that the great advances in the understanding of the seismic source prompted by investigations of the San Francisco earthquake had evidently not yet become common ground for all seismologists. Such delayed acceptance of the nature of earthquake source physics and the limited computational resources of the time did not allow a thorough analysis and development of a comprehensive model of the earthquake. Nevertheless, the observations and measurements by the early investigators of the 1908 earthquake and tsunami formed the basis for a century of analyses and ultimately allowed later scientists to achieve the present knowledge on the earthquake tectonic setting; the geometry, mode, and style of its causative rupture; the genesis of the tsunami; and the causes of the uneven damage distribution. The reports by Mercalli (1909) and Omori (1909) were among the first published on the Messina Straits earthquake. Both described the highly catastrophic consequences of the earthquake and hypothesized that the number of victims was close to 100,000, specifying that the unusual level of destruction was mainly due to the poor quality of construction, especially in the two main cities destroyed in the earthquake. Baratta (1910) reduced the estimated loss of lives to around 80,000, but he also reported that the severity of the shock induced Mercalli to add the XI degree to his own intensity scale. At the time of the earthquake many researchers were elaborating intensity scales and methods for deriving earthquake source information from felt report data. Using a method that was developed by Mallet (1862) and that was popular during the second half of the nineteenth century, Omori (1909) attempted to evaluate what he called the location of the “maximum earthquake motion” from near-field observations of overturned free-fall bodies, and assumed this to be coincident with the epicenter (Figure 1). Besides Mercalli (1909) and Omori (1909), many scientists published extensive macroseismic studies on the 1908 earthquake. De Stefani (1909), Martinelli (1909), Oddone (1909), Perret (1909), and several others studied the earthquake effects, and some of them produced isoseismal maps, but the most complete field survey is due to Baratta (1910). He collected a considerable amount of very detailed macroseismic data, pointing out the presence of several anomalies in the distribution of the intensity in zones that had already suffered strong damage in the 1783, 1894, and 1905 earthquakes. Baratta (1910) related this observation to the presence of areas of “seismic instability,” implicitly suggesting the existence of site amplification effects. Using Mallet’s approach with a larger number of observations, he determined a main center corresponding to Omori’s epicenter and a second one slightly north of it (Figure 1). Determining the epicenter from the arrival times of seismic waves was already common practice, but due to the difficulties in determining the correct timing of seismic phases and to the large uncertainties in regional wave propagation models, no attempt was made to this end: the results obtained by Omori and Baratta were considered reliable enough and indicative of the main seismic center. In fact, none of the numerous scientists who studied the 1908 earthquake in the years immediately following the event published an epicentral estimate obtained from the analysis of seismic waves. As for the hypocentral depth, a good estimate was derived by Oddone (1909) from the intensity distribution, using the relation between source depth and intensity attenuation published by Von Kövesligethy (1906): 9 km for the hypocentral depth and 0.02 km–1 for the intensity attenuation factor. In addition to the earthquake felt reports, Baratta (1910) also listed a number of observations on the height of the tsunami wave from eyewitness accounts. Platania (1909) focused on these accounts, making geodetic measurements of the level reached by the tsunami waves and estimating their period and direction of approach. Overall, including the studies of both Platania (1909) and Baratta (1910), more than 130 localities were surveyed. The mean run-up height, measured along a 300-km-long segment of the eastern Sicilian coast, was about 5 m, while the strongest effects occurred on a 80-km-long stretch from Galati Marina to Aci Trezza, with waves between 5 and 12 m in height (Figure 2). In the same paper Platania (1909) reported mareograms from different stations (Figure 3). The tsunami was recorded by the mareograph of Malta (about 250 km south of the epicenter) where the waves arrived about one hour after the earthquake and reached peak-to-peak amplitude as large as 90 cm with a period of about 20 minutes. North of the Messina Straits, the tsunami was recorded by the mareographs located in the harbors of Naples, Ischia, and Civitavecchia. The mareograph of Palermo was not functioning at the time of the earthquake. Back in operation around noon of the same day, it immediately started recording sea-level oscillations slightly smaller than 20 cm with a period of about 10 minutes. Platania (1909) attempted a physical interpretation of the tsunami wave velocity in connection with changes of sea floor depth. The basic theory of sea wave propagation and the gross bathymetry of the straits area were already known, but the lack of computational facilities and the poor knowledge of the earthquake source physics did not allow any further analysis of the tsunami. Antonio Loperfido (1909), an officer with the Italian Istituto Geografico Militare, remeasured two leveling lines fortuitously surveyed shortly before the earthquake, obtaining elevation changes at 114 benchmarks. Most of them (82) were located on the Calabrian shore and only a few (32) were on the Sicilian side of the straits, between Messina and the crest of the Peloritani mountain range (Figure 4). The density of the benchmarks and the accuracy of the measuring procedures were comparable to present day, but a fraction of the benchmarks subsided as a consequence of local settling of loose deposits, as remarked by Loperfido (1909) himself and by De Stefani (1910). Nevertheless the pattern of elevation changes appeared rather smooth and internally coherent, as expected for the surface signature of slip on a large normal fault, peaking at 54 cm in Reggio Calabria and nearly 70 cm in Messina. ▲ Figure 2. (A) Overview of coastal sites for which a measure of run-up is available (Gerardi et al. 2008). Red dots indicate coastal sites along the Sicilian coast; negative numbers indicate the distance of the sites from the origin point (Punta Faro). Yellow triangles mark coastal sites along the Calabrian coast; positive numbers indicate the distance of the sites from the origin point (Porto S. Venera). (B) Red dots and yellow triangles represent the measured run-up heights along the Sicilian and Calabrian coasts, respectively. 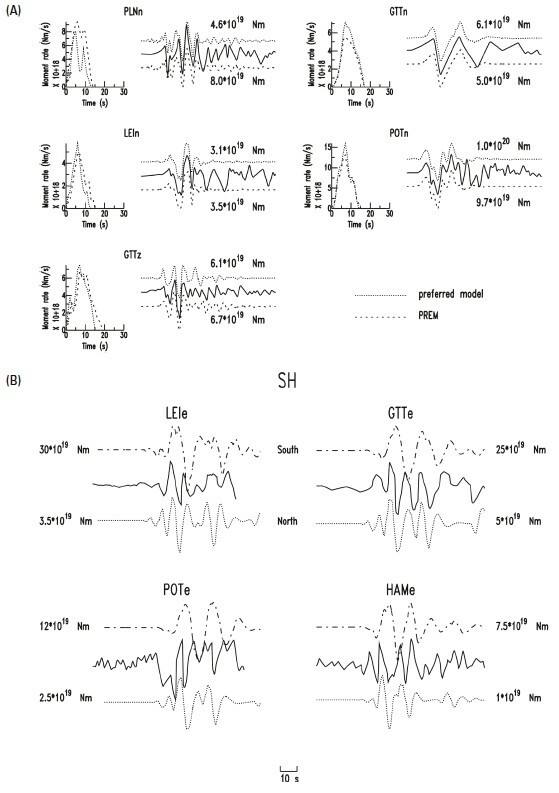 Shortly after the earthquake many investigators published analyses based on a few or even on individual seismograms (e.g., Agamennone 1909; Comas Sola 1909; Galitzin 1909; Malladra 1909; see Figure 5). The analyses described particular aspects of the recordings but were generally not focused on the study of the earthquake source. The analysis of the first pulse at close stations carried out by Omori (1909) was one of the few attempts to get insight into the source characteristics. He concluded that the direction of the first displacement excluded a volcanic explosion as a possible cause of the earthquake. The most complete compilation of seismological instrumental information was published by Rizzo (1911), who retrieved data from his fellow seismologists from all over the world. In addition to the reproduction of several original seismograms, Rizzo (1911) published parametric data for many stations that had recorded the earthquake, including their exact geographic coordinates, the earthquake arrival time, and the amplitude of the different phases. He indicated 04:20:27 as the arrival time of the first pulse at the Messina station and assumed this as the origin time of the earthquake, but no associated error was indicated. Overall Rizzo listed 110 stations at regional and teleseismic distance. Unfortunately, not too much could be done at the time with this rich crop of data except for estimates of the origin time and of an unreliably large hypocentral depth. Significant advances in Earth sciences were achieved during the decades immediately following the 1908 earthquake. Many seismologists published studies on the structure of the Earth’s interior from the analysis of seismic data (e.g., Mohorovičić 1910; Gutenberg 1912; Jeffreys 1926; Lehmann 1936) and the physical measure of the strength of radiated seismic waves (e.g., Richter 1935; Gutenberg 1945a, 1945b). The early 1960s marked the beginning of a period of great progress for the Earth sciences and for seismology in particular. The deployment of worldwide instrumental networks gave a great boost to the development of seismological theory, modeling, and data analysis. New concepts for describing the seismic source, such as the seismic moment, double-couple, and fault-plane solution, were quickly becoming part of the routine earthquake analysis. ▲ Figure 3. (A) Location of tide-gauge stations that recorded the tsunami (yellow dots). The red transparent ellipse indicates the source area of the earthquake. (B) Original tide-gauge records of the tsunami, as reported in Platania (1909). From top to bottom: Palermo, Naples, Civitavecchia, Ischia, and Malta. Note that time runs from right to left in the record of Malta. ▲ Figure 4. Overview of the elevation changes measured by Loperfido (1909) following the 1908 earthquake (in cm). The largest tectonic subsidence was recorded in Reggio Calabria. The Messina harbor also experienced subsidence up to 70 cm, but the observed values are suspected to reflect at least partially nontectonic deformation due to settling of coastal deposits. Many past earthquakes were reconsidered in the light of the newly acquired knowledge. As the largest earthquake ever recorded in Europe and one the strongest worldwide, the 1908 event was of particular interest for seismologists. Moreover, at the beginning of the 1970s the Italian government decided to launch a project for a bridge across the Messina Straits that would permanently connect Sicily to the mainland. The technical solution that was later selected for this task was a 3-km-long, single-span bridge. Although the project is still at a rather initial stage, building the longest single-span bridge in the world in a highly active area such as the Messina Straits requires accurate control and confident knowledge of the maximum expected earthquake, sparking a new era of monitoring and analysis of the region’s seismicity. At the beginning of a new phase of investigations of the 1908 earthquake prompted by the new engineering project, the intensity pattern and a rough location of the event were its sole known source characteristics. The intensity reports were reanalyzed with updated evaluation and field drawing criteria (e.g., Bottari et al. 1986), but the crucial contributions to understanding this earthquake came from processing the large amount of instrumental data (Table 1). ▲ Figure 5. (Left) Example of an original seismogram written by the 1908 earthquake on the 1,200-kg Wiechert instrument at Plauen (Germany), and (right) the corresponding digitized and corrected waveform. The original seismogram clearly shows the effects of the finite length and inclination of the arm. The first modern studies based on the instrumental data concerned the evaluation of the magnitude of the 1908 earthquake. Gutenberg and Richter (1954) included 1908 in their catalog of global seismicity, assigning it a magnitude ML = 7½, the largest magnitude ever assigned to this event. As reported in Table 2, several other investigators determined its magnitude, sometimes from single or a few seismograms, using different magnitude scales (ML, mB, MS, MW). These investigators generally obtained similar values, mostly between 6.9 and 7.2. By allowing a direct comparison with other great earthquakes, this objective measure of the earthquake’s strength made it clear that its severity went beyond what was expected based on its magnitude. This evidence was consistent with, and somehow confirmed, Mercalli’s (1909) and Omori’s (1909) intuition about the role of poor building construction practices in increasing the effects of the earthquake. A thorough analysis of the available instrumental data was accomplished by Schick (1977). Based on P-wave arrival times at a couple of close stations, he located the initiation of the rupture in the middle of the Messina Straits, a few kilometers south of the “seismic centers” indicated by Omori (1910) and Baratta (1910), and concluded that from there the rupture had propagated to the north. Extending the initial work of Riuscetti and Schick (1974), he also evaluated the body-wave and surfacewave magnitudes on original seismograms from amplitude data of at least 10 stations given by Rizzo (1911). Except for three stations in Japan, his results were quite stable, mostly ranging between 6.9 and 7.1, giving on average mB = 7.0 and MS = 7.1. Riuscetti and Schick (1974) and Schick (1977) also attempted an assessment of M0. The concept of seismic moment had been introduced shortly before (Aki 1966), but at that time the relatively poor knowledge of the Earth’s structure and the limited modeling and analysis tools did not allow it to be determined with confidence. By making several assumptions, these two studies determined M0 from body or surface waves. The authors used a single seismogram in both cases, obtaining 5 × 1018 and 5 × 1017 Nm for body and surface waves, respectively. These figures were significantly different from each other and overall just too small when compared to the magnitude estimates. According to Schick (1977), this discrepancy was ascribed to a much lower crustal rigidity, μ, than expected in the source area. Using polarities of 11 first arrivals, Riuscetti and Schick (1974) derived the first fault-plane solution for the 1908 event. Their nodal planes were oriented roughly parallel to the Sicilian coast (N20°E) and dipped 70° toward the WNW and 20° toward the ESE, accommodating approximately E-W extension. “There is not much doubt that the Messina earthquake was accompanied by normal faulting,” was their conclusion. This result was then confirmed by all successive studies, even those with an increased number of polarities, with the sole variations of a small component of lateral slip and changes (minor but tectonically significant) in the strike of the nodal planes (see Figure 6 and Table 2). The only significant exception to the interpretation of 1908 being a normal faulting earthquake is that of Brogan et al. (1975), who envisioned a possible origin of the 1908 earthquake as a compressional event that originated in the frame of the subduction of the Calabrian arc. We remark that, up to the mid-1970s, all investigation based on the instrumental seismological record concerned only first arrivals (arrival time and polarity) and P-wave amplitudes for magnitude evaluation; no analysis of the complete waveforms was attempted. The application of the dislocation theory to the study of the earthquake source significantly increased during the late 1950s–early 1960s, making the modeling of geodetic data a viable method for gaining information on faulting processes (e.g., Maruyama 1964). A full exploitation of leveling data, however, could be achieved only when modern computing tools became widely available. Almost 70 years after the Messina Straits earthquake, its source was investigated using the elevation changes meticulously collected by Loperfido (1909). Again, Schick (1977) pioneered the application of the new ideas to the 1908 event, even though his geodetic analysis was limited to a qualitative comparison of the data with a number of curves computed for generic 45°-dipping normal faults. 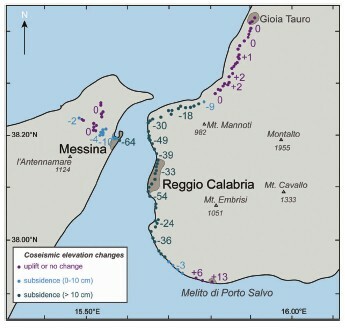 The original leveling data showed significant subsidence on both sides of the Messina Straits and mild uplift of the adjacent ranges. This pattern was incompatible with any of the used theoretical curves, particularly for a source located in the middle of the straits. This inconsistency drove Schick (1977) to the conclusion that the earthquake was generated by a unilateral sinking force superposed on a single-couple dislocation, with the latter corresponding to the west-dipping plane of the focal mechanism of Riuscetti and Schick (1974) and Schick (1977) (Figure 6; model A in Figure 7). Based on a similar qualitative approach, Caputo (1979) proposed a mechanism with a similar strike and a 50°–60° west-dipping plane. ▲ Figure 6. Summary of available fault-plane solutions for the 1908 earthquake. If indicated, the preferred fault plane is shown by a blue arrow. Mulargia and Boschi (1983) made significant progress in analyzing the geodetic data by computing the displacement field of model faults for the specific earthquake. They searched for the best-fitting focal mechanism and fault parameters by matching the theoretical and real elevation changes in a trialand- error scheme. The characteristics of the method required the separate modeling of three distinct subsets of the leveling data and the assumption of constant slip on the fault. The data were fit reasonably well by a 1.5-m dislocation of a grabenlike structure formed by two parallel and quasi-antithetic faults: an east-dipping, low-angle fault located near the northern end of the straits and a smaller, west-dipping, subvertical fault located more to the south, on the Calabrian side of the straits (Figure 6; Figure 7, model B). The nodal planes of their focal mechanism were very similar to those proposed by Riuscetti and Schick (1974) and Schick (1977). ▲ Figure 7. Surface projection of the published fault planes for the 1908 earthquake. A red line marks the intersection of the fault plane with the surface (cut-off line) and hence shows the direction of dip of the fault (but notice that all faults are explicitly or implicitly assumed to be blind). With the rapid increase in computing skills and the larger availability of computers, solving the inverse problem became a reality, and the elevation changes collected by Loperfido (1909) demonstrated all their potential. Capuano et al. (1988) first applied an inversion algorithm to these data searching for the best-fitting dislocation model. Their model fault consisted of several uniform slip rectangular segments compatible with a focal mechanism derived from 23 first-motion polarities. Unlike the fault-plane solution proposed by Riuscetti and Schick (1974), their mechanism (Figure 6) displayed a significant lateral component, which, coupled with the results of the analysis of elevation changes, resulted in a ∼25° difference in the strike of the fault, oriented N10W°. Though not large, this discrepancy is tectonically significant in the context of the Messina Straits. The results of Capuano et al. (1988) are characterized by a larger dislocation patch in the southern portion of the rupture and by a 56.7-km-long fault with the northern end well beyond the end of the Messina Straits proper (model D in Figure 7). They remarked that the fit of four benchmarks located in the Messina harbor forced the fault to shift westward by as much as 10 km. The reliability of these benchmarks, displaying significant subsidence (up to about 70 cm) in a very limited area, has been debated since the time of the earthquake. Loperfido (1909), as well as De Stefani (1910), contended that local collapse phenomena occurred along the line. Schematic overview of the main results obtained for the 1908 Messina Straits earthquake by several investigators, based on the analysis of instrumental, seismological and geodetic data (from Pino et al. 2000, modified and extended). Capuano et al. (1988) 6.9, 7.0, 7.2g 7.1 (6.2 × 1019) same as Gasparini et al. Seismic moments in parentheses are computed by using the formula derived by Ekström and Dziewonski (1988) for MS to M0 and by Chung and Bernreuter (1981) for ML to M0. Except for Schick (1977) and Pino et al. (2000), all of the others are from geodetic data. Both nodal planes are reported for seismic data solutions, while single planes are relative to geodetic data. Fault planes I and II are relative to a single solution acting in a grabenlike structure. mB at Graz (GRZ), Vienna (VIE), and Potsdam (POT), respectively. mB at Graz (GRZ), Sofia (SOF), and Zi-ka-wei (ZKW), respectively. At Rocca di Papa (RDP). From body waves at Hohenheim (HOH). From Rayleigh waves at Pulkovo (PUL). G. De Natale, personal communication. Constant slip. They also performed variable slip inversion. S = seismometric, G = geodetic, M = macroseismic. Giving credit to these considerations, Boschi et al. (1989) discarded the Messina harbor benchmarks and analyzed a dataset dominated by observations from the Calabrian side of the straits. They also contended that the Messina harbor benchmarks would have a very limited resolving power and would essentially be blind to slip on the deeper portion of the fault. They inverted the geodetic data for the focal mechanism first by imposing uniform dislocation and found that the data are well-satisfied by a low-angle, east-dipping fault was very similar to that proposed by Schick (1977) and to the northern fault of Mulargia and Boschi (1983) (Figure 6; model E in Figure 7); they then derived a slip distribution characterized by two main slip patches, with the largest displacement of about 3 m nearly coincident with the larger slip patch of Capuano et al. (1988). Shortly after, De Natale and Pingue (1991) presented the results of a further inversion for variable slip. Their solution was based on the model fault proposed by Capuano et al. (1988) and included all the controversial Messina harbor benchmarks (model F in Figure 7). Apart from the fault strike, the main difference between their solution and that presented by Boschi et al. (1989) was the obvious presence of a pronounced slip maximum beneath the Messina harbor. The results obtained for the seismic moment by these different groups were very consistent, stressing the robustness of models based on elevation changes: 6.2 Å~ 1019 Nm for Capuano et al. (1988); 3.7 × 1019 Nm for Boschi et al. (1989); 3.5 × 1019 Nm for De Natale and Pingue (1991). The proposed models still showed some scatter, for example, concerning the exact orientation of the fault and its length, partly originating from the data themselves (e.g., unreliability of the Messina benchmarks) and partly from modeling options. Nevertheless, the picture was slowly coming into focus, and the variability between different solutions (see Table 2 and models B, D, E, and F in Figure 7) turned out to be only slightly larger than that expected for much more recent large earthquakes. The investigations of the tsunami that followed the 1908 earthquake hold an important place in the long list of the papers that reconsidered this earthquake in the light of modern methods of analysis. The introduction of scales for measuring the magnitude of a tsunami and its relation with the associated earthquake (e.g., Iida 1963; Kajiura 1981) favored the comparison of the 1908 Messina Straits event with other known tsunamigenic earthquakes. Caputo (1979) and Tinti and Giuliani (1983) were the first to review the instrumental recordings and the maximum run-up data reported by Platania (1909). Both these studies critically analyzed the high ratio between the maximum wave height and the earthquake magnitude, stressing the role of the bathymetry of the Messina Straits in generating unusually high sea waves. All in all, the approach taken by these researchers was still rather simplistic, as sophisticated tsunami models required a detailed knowledge of the bathymetry of the region under investigation (e.g., with a spatial resolution of 100 m or better) and significant computational facilities; unfortunately, both these conditions were definitely at a premature stage at the beginning of the 1980s. The 1990s marked great scientific and technological progresses in seismology worldwide. The evolution of instrumentation was rapidly followed by the development of improved data processing techniques. New findings on the structure of the inner Earth and the seismic source produced new ideas and opened new fields of investigation. Studies of the links between crustal tectonics and faulting, the interaction between tectonic stress and preexisting faults, and the relations between small- and large-magnitude events became crucial topics in earthquake science. During the same decade, public concern about natural hazards greatly increased, and the demand for risk mitigation pushed the scientific community to address hazard-focused studies. The investigation of historic earthquakes became crucial in a country like Italy, where thousands of small earthquakes are recorded yearly but slip rates are relatively low and large earthquakes occur every 1,000–3,000 years (Basili et al. 2008; Galli et al. 2008): a fortunate condition but also one that makes the identification of major earthquake sources especially difficult. The study of the main seismogenic sources may certainly benefit from the analysis of instrumental earthquakes with modern techniques (e.g., joint or double-differences location), but the full understanding of their geometry and recurrence characteristics relies on the investigation of past large earthquakes such as 1908. The scientific—but also social and political—interest in the 1908 earthquake was further increased by the apparently imminent construction of the bridge across the straits. After several decades of relatively slow progress and elaboration, powerful computers and new analytical and processing tools—for example optical scanning and digitizing of old seismograms—were now making it possible to deal with historical instrumental data using modern techniques (Table 1). Meanwhile, forward and inverse modeling of seismometric, geodetic, and mareometric data also improved and became routine beginning in the mid- 1990s. Studies such that of Piatanesi et al. (1999) would have been much more difficult and time-consuming just a few years prior for standard computing facilities. These investigators performed a finite-elements simulation of the 1908 tsunami, using a mesh consisting of more than 16,000 elements, to compute synthetic mareograms for two different source mechanisms, those of Capuano et al. (1988) and Boschi et al. (1989) (models D and E in Figure 7, respectively). However, due to computational limitations, their analysis was limited to a comparison of the polarity of the first impacting wave and the pattern of the run-up heights. Piatanesi et al. (1999) concluded that, in comparison with the Capuano et al. (1988) model, the source proposed by Boschi et al. (1989) gives a better—but still rather poor—fit to the data. Tinti et al. (1999) tried to improve the match between observed run-up values and computed maximum tsunami levels by allowing heterogeneous slip on the fault. Their conclusion was that a better agreement resulted with most slip being released in the southern part of the fault. However, it is worth noting that all the seismic sources tested by Piatanesi et al. (1999) and Tinti et al. (1999) are unable to explain the overall observed height of the tsunami; both of these papers underestimated the maximum wave heights by a factor of 4–5 with respect to the actual run-ups, leaving the determination of the tsunamigenic source an unsolved problem. Pino et al. 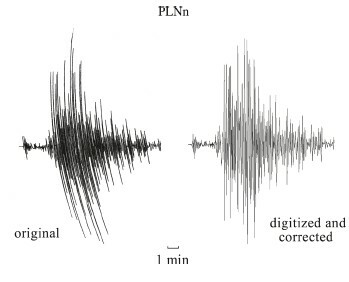 (2000) analyzed the digitized waveforms of the original historical seismograms. This has been a relatively simple task following the inception of SISMOS (Michelini, De Simoni et al. 2005) and Euroseismos (Ferrari and Pino 2003), two projects aimed at collecting and digitizing historical seismograms and developing new strategies for their analysis. By inverting P waveforms, Pino et al. (2000) derived source time functions and obtained an estimate of the seismic moment of 5.38 × 1019 Nm, corresponding to a moment magnitude MW = 7.1 (Figure 8A). From direct modeling of SH waveforms (Figure 8B), they also inferred that the earthquake was generated by unilateral rupture with northward directivity over a 43-km-long fault and turned the derived source time function into a slip distribution assuming an average rupture velocity of 2 km/s. 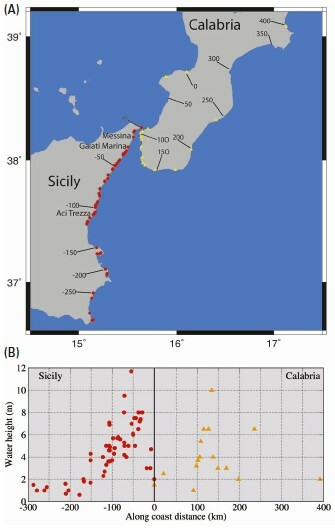 Overall, their conclusions were in good agreement with previous geodetic results, the only exception being that they found no evidence for the significant dislocation beneath the Messina harbor reported by De Natale and Pingue (1991), pointing to a limited reliability of the Messina harbor benchmarks (Figure 9). The correspondence between the slip distribution independently derived from seismological and geodetic data was considered by Pino et al. (2000) as a definite support for the assumed rupture velocity. Unfortunately, all analyzed seismograms were written by stations located in northern Europe; the large azimuthal gap made it impossible to discriminate unambiguously between the focal mechanisms of Capuano et al. (1988) and Boschi et al. (1989) based on waveform modeling alone. Amoruso et al. (2002) performed a joint inversion of the geodetic data and of the P-wave first-motion polarities. Their results for the focal mechanism were very similar to those of Capuano et al. (1988) and De Natale and Pingue (1991), but they obtained significant dislocation over a nearly 100-km-long fault (Figure 9). Their model fault extends beyond the northern end of the straits and south of the previously estimated epicenter, both areas that are poorly illuminated by the available elevation changes (model G in Figure 7). Finally, Michelini, Lomax et al. (2005) attempted a relocation of the earthquake epicenter based on NonLinLoc (NLL) (Lomax 2005), a code performing a probabilistic location using an importance-sampling method based on an efficient global cascading grid-search. The result is independent of the origin time estimate and insensitive to the presence of outliers. These features make NLL particularly suitable for the location of historical earthquakes. The epicenter of Michelini, Lomax et al. (2005) substantially confirmed the previous locations and, combined with the unilateral nature of the rupture, ruled out the possibility of significant dislocation south of the epicenter. During the past 100 years, tens of scientists have contributed to the development of a complete description of the 1908 Messina Straits earthquake, as if it were a much more recent event. This was made possible by progressive advancement in understanding of the seismic source, but also by the invaluable sets of data collected by pioneers of seismology at the time of the earthquake. Table 1 summarizes the main milestones in the investigations. The combination of the conclusions from the geodetic and seismological analyses, along with hints from the regional tectonic setting, constrains well the geometry and extent of the fault and its rupture style. The 1908 earthquake was caused by dominantly normal slip on an approximately NNE-SSW trending plane dipping to the east, extending from about 3 to 12 km depth and for a length of 40–45 km from the epicenter in the south to the northern end of the straits. The rupture initiated at 37.96° N, 15.71° E and propagated unilaterally northward at about 2 km/s. The slip pattern exhibits three main patches of dislocation, with a maximum of 3–4 m slightly south of the city of Reggio Calabria and an average of 1.5–2.0 m. The seismic moment associated with the event is bracketed by the estimates obtained from geodetic (3.5 × 1019 Nm) and seismological data (5.4 × 1019 Nm), corresponding to a moment magnitude in the range MW = 7.0–7.1. ▲ Figure 8. (A) On the right are illustrated the recorded data (continuous line) for the 1908 earthquake and synthetic P-wave seismograms obtained by Pino et al. (2000) for different German stations (PLN, Plauen; LEI, Lipsia; GTT, Göttingen; POT, Potsdam; the small letter indicates the component). Synthetics result from waveform inversion performed for two different structural models. The numbers indicate the resulting seismic moment. On the left, the corresponding moment rate functions. (B) SH wave data (continuous line) and synthetic waveforms computed by Pino et al. (2000) for two different apparent source durations, derived from the P-wave durations illustrated in Figure 10 and corresponding to southward and northward rupture propagation, respectively (HAM, Hamburg). From the better waveform correspondence and the consistency of the seismic moment with those resulting for P waves, Pino et al. (2000) deduced that rupture propagation must have been dominantly northward. Both the geodetic and seismological estimates of the rupture length carry uncertainties, but fortunately they tend to compensate. Due to the geometry of the leveling network in relation to the earthquake source, the inversions of the elevation changes are most sensitive to the central portion of the fault at depth but leave the middle and shallow portion of the fault largely unresolved. Similarly, the actual location of the southern end of the fault is poorly resolved by the leveling network. This may have led to a significant underestimation of coseismic slip, and therefore of the seismic moment. The seismological estimates of the rupture length, however, suggest that the rupture did not exceed 40–45 km (Figure 9) and that the earthquake causative fault lies entirely within the Messina Straits proper. Thus, the seismic moment/magnitude range is asymmetric and higher values are to be preferred, but the upper bound of the range appears to be rather tightly constrained. The exact strike of the fault plane from geodetic evidence is still uncertain, depending on whether or not the Messina harbor benchmarks are included in the computations. The results of the seismic waveform analysis, however, combined with geologic and tectonic evidence, suggest that the Messina benchmarks recorded a combination of tectonic and nontectonic subsidence, and that a NNE-striking fault plane better satisfies all available evidence. The resulting source model is very similar to that proposed by Boschi et al. (1989) (model E in Figure 7). Figure 10 shows the match between the fault location, size, orientation, and the rupture directivity on the one hand and the damage pattern on the other hand. Aside from site effects, this source model explains well the differential decay of intensity on the two shores of the straits and the much larger damage suffered by Calabrian cities and villages (see also Figure 1B). ▲ Figure 9. Slip distribution along-strike of the fault resulting from various studies. The diagram consistently shows the maximum slip recorded along each section of the fault. The horizontal bars below the diagram mark the corresponding fault length and relative position along a N-S section. Dashed red lines represent the slip error resulting from the seismic moment uncertainty given in Pino et al. (2000). The image of the 1908 earthquake stemming from a century of investigations is rather coherent and only a few significant uncertainties still remain. Perhaps the only really open issue concerns the causative source of the strong tsunami. Very recently, two papers reached substantially opposite conclusions and further stirred debate. Billi et al. (2008) proposed that the origin of the tsunami must be related to a large submarine landslide, set in motion by the strong shaking and/or the stress transfer induced by the earthquake; conversely, Gerardi et al. (2008) contended that the pattern of run-ups along the Calabrian and Sicilian coasts is more compatible with a tsunami generated by tectonic dislocation of the sea floor than with a tsunami resulting from a submarine landslide. Solving this problem requires even more accurate tsunami calculations than those already performed by Piatanesi et al. (1999) and Tinti et al. (1999), including the modeling of the inundation phase using very detailed bathymetry and topography. It has been shown that the inversion of tide gauge records allows for the determination of some important characteristics of the rupture process, for example, the slip distribution on the fault plane (e.g., Satake 1987; Hirata et al. 2003; Piatanesi and Lorito 2007; Lorito, Romano et al. 2008); this technique has been successfully applied also to historical events such as the 1906 San Francisco earthquake (Lorito, Piatanesi et al. 2008). For the 1908 Messina tsunami there exist tide gauge records for Malta, Naples, Ischia, Civitavecchia, and Palermo (Figure 3). These have not yet been used in a quantitative fashion, but could offer important new constraints to determine the characteristics of the tsunamigenic source. ▲ Figure 10. Synoptic view of the 1908 earthquake rupture history and of the associated damage. The intensity pattern (from Guidoboni et al. 2007) is shown with a color scale ranging from yellow to blue (intensity VI to XI, respectively); the area of strongest shaking is outlined by a dotted/dashed line (see also Figure 1). The black box is the surface projection of the model fault proposed by Boschi et al. (1989) (E in Figure 7). The star locates the epicenter proposed by Michelini, Lomax et al. (2005). The black arrow indicates the rupture directivity proposed by Pino et al. (2000). See text for discussion. The Messina Straits cut with a NNE-SSW trend the southern Calabrian arc. This large geodynamic feature comprises the surface evidence of the northwestward subduction of the Ionian lithosphere, separating the African plate from the thinned backarc Tyrrhenian basin. During the Pliocene and Pleistocene, the Calabrian arc experienced rapid uplift along a trend parallel to the arc axis, leading to the activation of arc-parallel half-graben structures (Ghisetti 1984; Westaway 1993; Bordoni and Valensise 1998; DISS Working Group 2007; Basili et al. 2008). The longitudinal fault system is segmented by transversal NW-SE and E-W structures, also detectable in the peri-Tyrrhenian basins (Fabbri et al. 1980; Barone et al. 1983). The straits itself is one of these N-S half-grabens (Ghisetti 1992), bent in the E-W direction at its northern end (Selli et al. 1978). 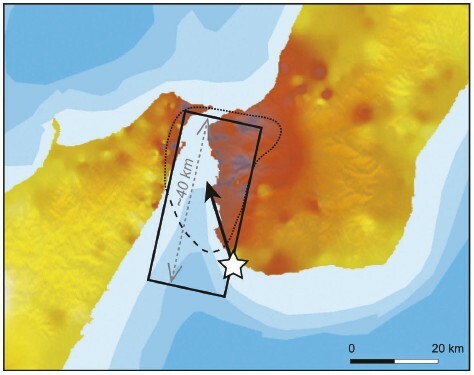 Reliable GPS measurements suggest large strains ( ~ 100 nanostrain/y) and extension perpendicular to the axis of the Messina Straits at a rate ranging from 3.6 mm/y (D’Agostino and Selvaggi 2004) to 2.0 mm/y (Serpelloni et al. 2007), in agreement with the E-W to ESE-WNW extension shown by the focal mechanisms obtained for the 1908 earthquake. Multiple lines of evidence thus suggest that the causative fault of the 1908 earthquake plays a major role in the geodynamic evolution of the Calabrian arc. By comparing the 1908 coseismic elevation changes with topographic and geomorphic features, Valensise and Pantosti (1992) proposed that repeated 1908-type earthquakes, with similar dislocation along similar fault length, have largely shaped the present structure of the Messina Straits (Figure 11). Moreover, by comparing the coseismic elevation changes and the elevation of a well-dated geological marker, they estimated a repeat time of 1908-type earthquakes of 1,000 years (+500, –300) and an average extension rate of 1.2 mm/y across the Messina Straits, corresponding to a minimum fault slip rate of 1.4 mm/y. The seismological evidence for a larger seismic moment than that determined geodetically suggests that actual repeat times are close to the upper limit of the above interval, also as indicated by historical and archaeological evidence (Guidoboni et al. 2000). 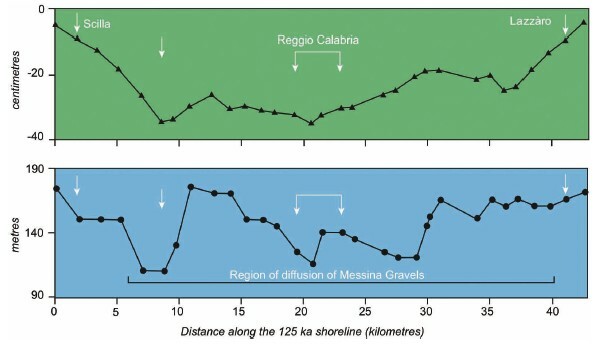 According to D’Agostino and Selvaggi (2004), however, up to 80% of the 3.6 mm/y relative motion between the Sicilian and Calabrian blocks may be accommodated in the Messina Straits, loading the fault responsible for the 1908 earthquake. This would imply somewhat faster extension and correspondingly shorter recurrence intervals. But, if both the geological and geodetic estimates are accurate, either significant deformation occurs aseismically, or else other—presumably secondary—faults are required to accommodate this relative motion. Conversely, the 2.0 mm/y extension rate estimated by Serpelloni et al. (2007) requires no extra strain to be accommodated across the straits in addition to that associated with 1908-type earthquakes. ▲ Figure 11. Comparison between 1908 observed coseismic subsidence (above) and the elevation of the 125-ka terrace inner edge along the Calabrian shore of the Messina Straits from Scilla (to the north; far left in figure) to Lazzàro (south; far right), suggesting that repeating 1908-type earthquakes may reproduce the young landscape of the region (from Valensise and Pantosti 1992). Whatever the case, the fault responsible for the 28 December 1908 Messina Straits catastrophic earthquake is definitely a major seismogenic structure capable of MW = 7.1 events lying beneath a densely populated area. The image developed throughout a century of investigations represents fundamental knowledge for the prediction of the ground motion in case of repetition of a strong earthquake and becomes of special value in the design of major infrastructures, such as the planned permanent crossing of the Straits. We are grateful to the editor Luciana Astiz and an anonymous reviewer for their precious comments and suggestions. Abe, K. (1981), Magnitudes of large shallow earthquakes from 1904 to 1980. Physics of the Earth and Planetary Interiors 27, 72–92. Abe, K., and S. Noguchi (1983), Revision of magnitude of large shallow earthquakes, 1897–1912. Physics of the Earth and Planetary Interiors 33, 1–11. Agamennone, G. (1909). Importante particolarita` nei sismogrammi del Regio Osservatorio Geodinamico di Rocca di Papa in occasione dei terremoti calabri dell’8 settembre 1905 e 28 dicembre 1908. Atti della Reale Accademia dei Lincei. Rendiconti della Classe di Scienze Fisiche, Matematiche e Naturali 18, 339–343. Aki, K. (1966). Generation and propagation of G waves from the Niigata earthquake of June 16, 1964: Part 2. Estimation of earthquake moment, released energy, and stress-strain drop from the G wave spectrum. Bulletin of the Earthquake Research Institute, University of Tokyo 44, 73–88. Amoruso, A., L. Crescentini, and R. Scarpa (2002). Source parameters of the 1908 Messina Straits, Italy, earthquake from geodetic and seismic data. Journal of Geophysical Research 107 (B4), 2080; doi:10.1029/2001JB000434. Baratta, M. (1910). La catastrofe sismica calabro-messinese (28 dicembre 1908), Relazione alla Società Geografica Italiana. Roma: Società Geografica Italiana. Barone, A., A. Fabbri, S. Rossi, and R. Sartori (1983). Geological structure and evolution of the marine areas adjacent to the Calabrian arc. In Structure, Evolution and Present Dynamics of the Calabrian Arc, E. Mantovani and R. Sartori ed,, Earth Evolution Sciences, International Monograph Series on Interdisciplinary Earth Sciences Research and Applications 2, (3). Braunschweig: Friederich Vieweg und Sohn, 207–221. Basili, R., G. Valensise, P. Vannoli, P. Burrato, U. Fracassi, S. Mariano, M. Tiberti, and E. Boschi (2008). The Database of Individual Seismogenic Sources (DISS), version 3: Summarizing 20 years of research on Italy’s earthquake geology. Tectonophysics 453, 20–43; doi:10.1016/j.tecto.2007.04.014. Billi A., R. Funiciello, L. Minelli, C. Faccenna, G. Neri, B. Orecchio, and D. Presti (2008). On the cause of the 1908 Messina tsunami, southern Italy. Geophysical Research Letters 35, L06301; doi:10.1029/2008GL033251. Bordoni, P., and G. Valensise (1998). Deformation of the 125 ka marine terrace in Italy: Tectonic implications. In Late Quaternary Coastal Tectonics, ed. I. S. Stewart and C. Vita Finzi, 71–110. Special publication 146. London: Geological Society, London. Boschi, E., G. Ferrari, P. Gasperini, E. Guidoboni, G. Smriglio, and G. Valensise (1995). Catalogo dei forti terremoti in Italia dal 461 a.C. al 1980. Bologna: ING-SGA, 973 pps. and a CD-ROM. Boschi, E., D. Pantosti, and G. Valensise (1989). Modello di sorgente per il terremoto di Messina del 1908 ed evoluzione recente dell’area dello Stretto. Atti VIII Convegno G.N.G.T.S., Roma, 245–258. Bottari, A., E. Carapezza, M. Carapezza, P. Carveni, F. Cefali, E. Lo Giudice, and C. Pandolfo (1986). The 1908 Messina Strait earthquake in the regional geostructural framework. Journal of Geodynamics 5, 275–302. Brogan, G. E., L. S. Cluff, and C. L. Taylor (1975). Seismicity and uplift of southern Italy. Tectonophysics 29, 323–330. Capuano, P., G. De Natale, P. Gasparini, F. Pingue, and R. Scarpa (1988). A model for the 1908 Messina Straits (Italy) earthquake by inversion of leveling data. Bulletin of the Seismological Society of America 78, 1,930–1,947. Caputo, M. (1979). Seismicity in the Straits of Messina. In L’attraversamento dello Stretto di Messina e la sua fattibilità, Atti dei Convegni Lincei, Roma: Accademia Nazionale dei Lincei 43, 101–117. 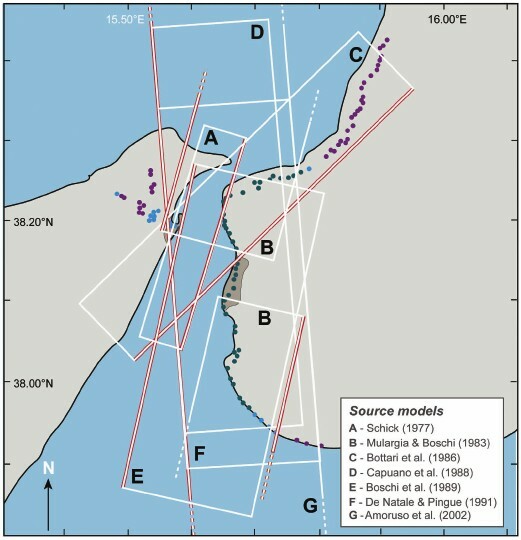 Caputo, M., L. Pieri, M. Barbarella, A. Gubellini, P. Russo, and R. Console (1981), Geophysical and geodetic observations in the Messina Straits, Tectonophysics 74, 147–154. Chung, D.H., and D.L. 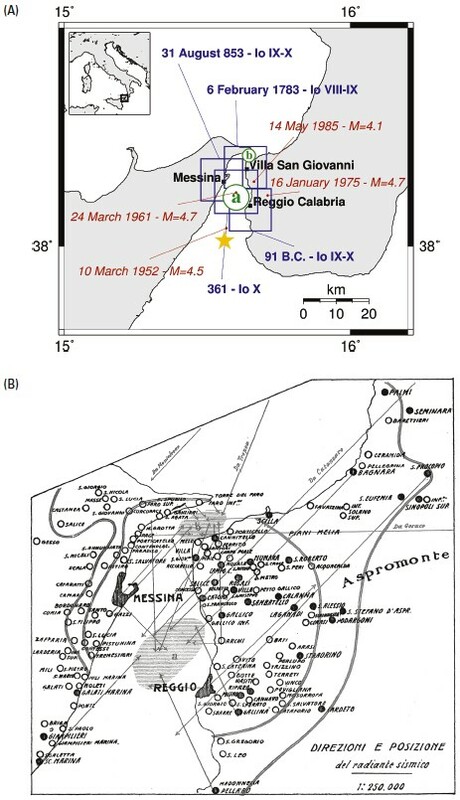 Bernreuter (1981), Regional relationship among earthquake magnitude scales, Reviews of Geophysics 19 (4), 649–663. Comas Sola, J. (1909). Le tremblement de terre du 28 dècembre 1908, enregistrè—l’Observatoire Fabra (Barcelone). Comptes Rendus Hebdomadaires des Séances de l’Académie des Sciences.148, 202–203. Console, R, and P. Favali (1988). Historical seismograms in Italy. In Historical Seismograms and Earthquakes of the World, W. K. H. Lee, H Meyers, and K. Shimazaki, ed. Academic, San Diego, CA: Academic Press, 447–450. D’Agostino, N., and G. Selvaggi (2004). Crustal motion along the Eurasia- Nubia plate boundary in the Calabrian arc and Sicily and active extension in the Messina Straits from GPS measurements. Journal of Geophysical Research 109, B11402; doi:10.1029/2004JB002998. De Natale, G., and F. Pingue (1991). A variable slip fault model for the 1908 Messina Straits (Italy) earthquake, by inversion of leveling data. Geophysical Journal International 104, 73–84. De Stefani, C. (1909). Riassunto delle osservazioni fatte dopo il terremoto calabro-siculo del 1908. In Relazione della Commissione Reale incaricata di designare le zone pi. adatte per la ricostruzione degli abitati colpiti dal terremoto del 28 dicembre 1908 o da altri precedenti. Roma: Accademia Nazionale dei Lincei. 97–105. De Stefani, C. (1910). La livellazione sul litorale calabro-siculo dopo il terremoto del 1908. Bollettino della Società Geologica Italiana 29. 223–231. Dewey, J., and P. Byerly (1969). The early history of seismometry (to 1900). Bulletin of the Seismological Society of America 59 (1), 183–227. DISS Working Group (2007). Database of Individual Seismogenic Sources (version 3.0.4): A compilation of potential sources for earthquakes larger than M 5.5 in Italy and surrounding areas. Available at: http://www.ingv.it/DISS. Ekström, G., and A.M. Dziewonski (1988), Evidence of bias in estimation of earthquake size, Nature 332 319–323. Fabbri, A., F. Ghisetti, and L. Vezzani (1980). The Peloritani-Calabria range and the Gioia basin in the Calabrian arc (southern Italy): Relationships between land and marine data. Geologica Romana 19, 131–150. Ferrari, G., and N. A. Pino (2003). Euroseismos 2002–2003 a project for saving and studying historical seismograms in the Euro-Mediterranean area. Geophysical Research Abstracts 5, EAE03-A-05274. Galitzin, B. (1909). Das Sicilianische Erdbeben am 28. Dezember 1908 nach den Aufzeichnungen der Pulkowa’schen seismischen Station. Bulletin de l’Académie Impériale des Sciences de St.-Pétersbourg, série 6 3 (4) 279–298. Galli P., F. Galadini, and D. Pantosti (2008). Twenty years of paleoseismology in Italy. Earth-Science Reviews 88, 89–117. Gasparini, C., G. Iannaccone, P. Scandone, and R. Scarpa (1982). Seismotectonics of the Calabrian arc. Tectonophysics 84, 267–286. Gerardi, F., M. S. Barbano, P. M. De Martini, and D. Pantosti (2008). Discrimination of tsunami sources (earthquake vs. landslide) on the basis of historical data in eastern Sicily and southern Calabria. Bulletin of the Seismological Society of America 98 (6), 2,795–2,805. Ghisetti, F. (1984). Recent deformations and the seismogenic source in the Messina Strait (southern Italy). Tectonophysics 109, 191–208. Ghisetti, F. (1992). Fault parameters in the Messina Strait (southern Italy) and relations with the seismogenic source. Tectonophysics 210, 117–133. Gilbert, G. K. (1884). A theory of earthquakes of the Great Basin, with a practical application. American Journal of Science 27, 49–53. Guidoboni, E., A. Muggia, and G. Valensise (2000). Aims and methods in territorial archaeology: Possible clues to a strong IV century A.D. earthquake in the Straits of Messina (southern Italy). In The Archaeology of Geological Catastrophes, ed. B. McGuire, D. Griffiths, and I. Stewart, 45–70. Special publication 171. London: Geological Society, London. Guidoboni, E., G. Ferrari, D. Mariotti, A. Comastri, G. Tarabusi, and G. Valensise (2007). CFTI4Med, Catalogue of Strong Earthquakes in Italy (461 B.C.–1997) and Mediterranean Area (760 B.C.–1500). Bologna: INGV-SGA. Available at http://storing.ingv.it/cfti4med/. Gutenberg, B. (1912). Ueber erdbebenwellen. VII A, Beobachtungen an registrierungen von fernbeben in Göttingen und folgerungen über die konstitution des erdkörpers. Nachrichten von der Gesellschaft der Wissenschaften zu Göttingen, Mathematisch-Physikalische Klasse, 125–176. Gutenberg, B. (1945a). Amplitudes of surface waves and magnitudes of shallow earthquakes. Bulletin of the Seismological Society of America 35, 3–12. Gutenberg, B. (1945b). Amplitudes of P, PP, and S and magnitudes of shallow earthquakes. Bulletin of the Seismological Society of America 35, 57–69. Gutenberg, B., and C. F. Richter (1954). Seismicity of the Earth and Associated Phenomena. 2nd ed. Princeton, NJ: Princeton University Press. Hirata, K., E. Geist, K. Satake, Y. Tanioka, and S. Yamaki (2003). Slip distribution of the 1952 Tokachi-Oki earthquake (M 8.1) along the Kuril trench deduced from tsunami waveform inversion. Journal of Geophysical Research 108 (B4), 2196; doi:10.1029/2002JB001976. Hoernes, R. (1878). Erdbeben studien. Jahrbuch der Kaiserlich- Königlichen Geologischen Reichsanstalt 28, 387–448. Hurtig, E., and G. Kowalle (1988). Analysis of historical seismograms from the Potsdam station (GDR) in the period 1902–1910. In Historical Seismograms and Earthquakes of the World, W. K. H. Lee, H. Meyers, and K. Shimazaki, ed. San Diego, CA: Academic Press, 51–56. Iida, K. (1963). A relation of earthquake energy to tsunami energy and the estimation of the vertical. displacement in a tsunami source. Journal of Earth Sciences, Nagoya University 2, 49–67. Jeffreys, H. (1926). The rigidity of the Earth’s central core. Monthly Notices of the Royal Astronomical Society, Geophysical Supplement 1, 371–383. Kajiura, K. (1981). Tsunami energy in relation to parameters of earthquake fault model. Bulletin of the Earthquake Research Institute, University of Tokyo 56, 415–440. Kárnik, V. (1969). Seismicity of the European Area, Part 1. Dordrecht, Holland: D. Reidel Publishing Company. Lawson, A. C., chairman (1908). The California Earthquake of April 18, 1906: Report of the State Earthquake Investigation Commission. Washington, DC: Carnegie Institution of Washington Publication 87. Lehmann, I. (1936). P’. Publications du Bureau Central Séismologique International A 14, 87–115. Lomax, A. (2005). A reanalysis of the hypocentral location and related observations for the great 1906 California earthquake. Bulletin of the Seismological Society of America 95 (3), 861–877; doi:10.1785/0120040141. Loperfido, A. (1909). Livellazione geometrica di precisione eseguita dall’I.G.M. sulla costa orientale della Sicilia, da Messina a Catania, a Gesso ed a Faro Peloro e sulla costa occidentale della Calabria da Gioia Tauro a Melito di Porto Salvo. In Relazione della Commissione Reale incaricata di designare le zone più adatte per la ricostruzione degli abitati colpiti dal terremoto del 28 dicembre 1908 o da altri precedenti. Roma: Accademia Nazionale dei Lincei, 131–156. Lorito, S., F. Romano, A. Piatanesi, and E. Boschi (2008). Source process of the September 12, 2007, MW 8.4 southern Sumatra earthquake from tsunami tide gauge record inversion. Geophysical Research Letters 35, L02310; doi:10.1029/2007GL032661. Lorito, S., A. Piatanesi, and A. Lomax (2008). Rupture process of the April 18, 1906 California earthquake from near-field tsunami waveform inversion. Bulletin of the Seismological Society of America 98 (2), 832–845; doi:10.1785/0120060412. Malladra, A. (1909). Il sismogramma alpino del grande terremoto calabromessinese. Rivista di Fisica, Matematica e Scienze Naturali 110, 5–32. Martinelli, G. (1909). Osservazioni preliminari sul terremoto calabromessinese del 28 dicembre 1908. Bollettino della Società Meteorologica Italiana, serie 3 28, 3–11. Maruyama, T. (1964). Statical elastic dislocation in an infinite and semiinfinite medium. Bulletin of the Earthquake Research Institute, University of Tokyo 42, 289–368. Mercalli, G. (1909). Contributo allo studio del terremoto calabro-messinese del 28 dicembre 1908. Atti del Reale Istituto d’Incoraggiamento di Napoli, serie 6, 7, 249–292. Michelini, A., B. De Simoni, A. Amato, and E. Boschi (2005). Collecting, digitizing, and distributing historical seismological data. Eos, Transactions, American Geophysical Union 86 (28), 261; doi:10.1029/2005EO280002. Michelini, A., A. Lomax, A. Nardi, A. Rossi, B. Palombo, and A. Bono (2005). A modern re-examination of the locations of the 1905 Calabria and the 1908 Messina Straits earthquakes. Geophysical Research Abstracts 7, EGU05-A-07909. Mohorovičić, A. (1910). Das beben vom 8.10.1909. Jarbuch des Meteorologischen Observatorium in Zagreb (Agram), für das Jahr 1909, 9 (4) 3–63. Mulargia, F., and E. Boschi (1983). The 1908 Messina earthquake and related seismicity. In Earthquakes: Observation, Theory and Interpretation, ed. H. Kanamori and E. Boschi, 493–518. Proceedings of the International School of Physics Enrico Fermi, course 85. Amsterdam and New York: Elsevier. Oddone, E. (1909). Calcolo provvisorio della profondità dell’ipocentro del terremoto calabro-siculo del 28 dicembre 1908. Atti della Reale Accademia dei Lincei. Rendiconti della Classe di Scienze Fisiche, Matematiche e Naturali 18, 186–192. Omori, E. (1909). Preliminary report on the Messina-Reggio earthquake of Dec. 28, 1908. Bulletin Imperial Earthquake Investigation Committee 3 (2), 37–46. Perret, F. A. (1909). Preliminary report on the Messina earthquake of December 28, 1908. American Journal of Science 27, 321–334. Piatanesi, A., and S. Lorito (2007). Rupture process of the 2004 Sumatra-Andaman earthquake from tsunami waveform inversion. Bulletin of the Seismological Society of America 97 (1), 223–231; doi:101785/0120050627. Piatanesi, A., S. Tinti, and E. Bortolucci (1999). Finite-elements simulations of the 28 December 1908 Messina Straits (southern Italy) tsunami. Physics and Chemistry of the Earth, part A 24, 145–150. Pino, N. A., D. Giardini, and E. Boschi (2000). The December 28, 1908, Messina Straits, southern Italy, earthquake: Waveform modeling of regional seismograms. Journal of Geophysical Research 105 (B11), 25,473–25,492. Platania, G. (1909). Il maremoto dello Stretto di Messina del 28 dicembre 1908. Bollettino Società Sismologica Italiana 13, 369–458. Reid, H. F. (1910). The mechanics of the earthquake. Vol. 2 of The California Earthquake of April 18, 1906: Report of the State Earthquake Investigation Commission. Washington, DC: Carnegie Institution of Washington Publication 87, 2. Richter, C. F. (1935). An instrumental earthquake magnitude scale. Bulletin of the Seismological Society of America 25, 1–32. Ritter, J. R. R. (2002). On the recording characteristics of the original Wiechert seismographs at Göttingen (Germany). Journal of Seismology 6, 477–486. Riuscetti, M., and R. Schick (1975). Earthquakes and tectonics in southern Italy. Bollettino di Geofisica Teorica ed Applicata 17 (65), 59–78. Rizzo, G. B. (1911). Sulla propagazione dei movimenti prodotti dal terremoto di Messina del 28 dicembre 1908. Memorie della Reale Accademia delle Scienze di Torino, Serie 2 61, 355–417. Satake, K. (1987). Inversion of tsunami waveforms for the estimation of a fault heterogeneity: Method and numerical experiments. Journal of Physics of the Earth, 35, 241–254. Schick, R. (1977). Eine seismotektonische Bearbeitung des Erdbebens von Messina im Jahre 1908. Geologisches Jahrbuch, Reihe E 11, 74 pp. Selli, R., P. Colantoni, A. Fabbri, S. Rossi, A. M. Borsetti, and P. Gallignani (1978). Marine geological investigation of the Messina Strait and its approaches. Giornale di Geologia 42 (2), 1–70. Serpelloni, E., G. Vannucci, S. Pondrelli, A. Argnani, G. Casula, M. Anzidei, P. Baldi, and P. Gasperini (2007). Kinematics of the Western Africa–Eurasia plate boundary from focal mechanisms and GPS data. Geophysical Journal International 169 (3), 1,180–1,200; doi:10.1111/j.1365-246X.2007.03367.x, 2007. Tinti, S., A. Armigliato, E. Bortolucci, and A. Piatanesi (1999). Identification of the source fault of the 1908 Messina earthquake through tsunami modelling. It is a possible task? Physics and Chemistry of the Earth, part B, 24, 417–421. Tinti, S., and D. Giuliani (1983). The Messina Straits tsunami of December 28, 1908: A critical review of experimental data and observations. Il Nuovo Cimento 6, 429–442. Valensise, G., and D. Pantosti (1992). A 125-Kyr-long geological record of seismic source repeatability: The Messina Straits (southern Italy) and the 1908 earthquake (MS 7½). Terra Nova 4, 472–483. Von Kövesligethy, R. (1906). Seismonomia. Bollettino della Società Sismologica Italiana 11, 113–250 (in Latin). Westaway, R. (1993). Quaternary uplift of Southern Italy. Journal of Geophysical Research 98, 21,741–21,772.